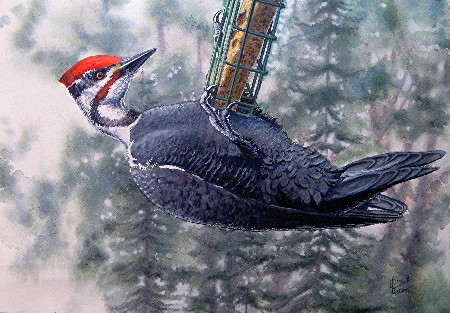 Suspended horizontally in our backyard from our small peanut butter/suet feeder was a comical pileated woodpecker. This was a male, as evidenced by his red “moustache,” and proved to be quite a determined acrobat as he fed from a feeder frequented by chickadees and nuthatches. We also had a large beef suet feeder nearby for woodpeckers, which he vertically fed from as well but kept returning to the one with the peanut butter. He kept this up for a couple of hours, turning the suet block into something that resembled swiss cheese it but was more than worth the price of admission.